It isn’t some jingoistic call to arms that I refer to but rather a dispassionate, indiscriminate killer. More terrifying, more sinister and certainly more effective in its kill rate than any cannon shot or sabre, it is Rickettsia prowazeki, the organism that causes typhus, and because of its prevalence on campaign, the disease the common soldier simply called “war fever”. It isn’t known with any kind of accuracy how many soldiers and civilians were killed in the Napoleonic Wars. A ball-park consensus typically estimates between 2.5 and 3.5 million combatants and perhaps another 1.5 to 2.5 million non-combatants died during the course of the wars. But what is clear is that, in tune with all wars up until the 20th century, the battle casualties were dwarfed by those caused by disease. One reasonably accurate example to support this comes from the British Army medical services who recorded the deaths of patients in their hospitals in the Peninsula between 1812 and 1814. Deaths due to wounds were 2,699 whereas deaths due to diseases of various kinds amounted to 13,124. But perhaps the most pronounced example of the devastating effect of disease on Napoleonic campaigns came in Russia in 1812. 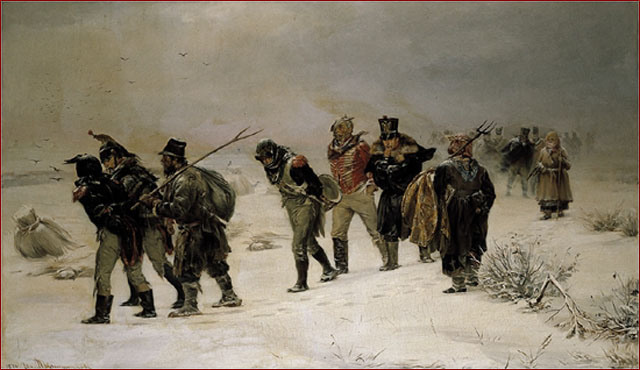 Almost since the immediate aftermath of the epic failure of Napoleon’s Russian campaign, the principal blame for the disaster was laid at the door of the weather – “General Frost”. It is true that the winter of 1812 was the harshest for many years but what also seems true is that the campaign was utterly doomed from shortly after it was launched in the early summer. On 22nd June Napoleon reviewed his massive army gathered on the west bank of the River Nieman and the next day, with great fanfare, they began to cross and launch their offensive into Russian territory. As per usual policy Napoleon’s forces lived off the land during campaign. Unhindered by a cumbersome baggage train this allowed his armies to deploy more flexibly but would only work if the territory they advanced over could support their needs. Inevitably this meant depredations on the local civilian population but this had proved sustainable in central and western Europe. However, Poland and western Russia was another matter. Utter poverty was endemic in these regions and from the start food was in short supply. And with poverty comes squalor, with squalor comes vermin and with vermin comes disease. Memoirs by the French soldiers and their allies related the filthy conditions of the villages in Poland and include descriptions of local inhabitants being infested with lice. Within days of crossing the Niemen, soldiers began to develop high fevers and pink rashes on their bodies. Typhus had broken out in the Grande Armée. Typhus is a particularly dreadful disease spread by human body lice and, of course, where better than the conditions of a military campaign with thousands of sweaty, dirty bodies in close proximity for the disease to reach epidemic proportions. A louse becomes infected with typhus by taking a blood meal from a fever-ridden human. 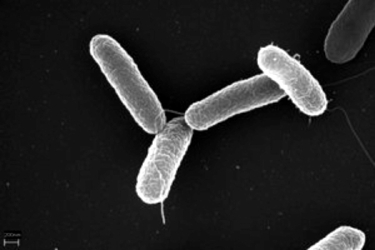 Once in the louse’s gut, the rickettsiae bacteria reproduce in such enormous numbers that they cause cells in the insect’s gut to rupture. Humans become infected by rubbing or scratching the lice faeces, infected with the rickettsiae bacteria, into their skin or into their mucous membranes. Once infected, humans experience a high fever that continues for approximately two weeks. Simultaneous symptoms may include severe headaches, bronchial disturbances, and mental confusion. After approximately six days, red eruptions appear on the torso, hands, feet, and face. Mortality is incredibly high under epidemic conditions, nearing 100%. Just a month into the campaign, Napoleon had lost 80,000 soldiers to typhus and dysentery. Fierce actions were conducted at Smolensk and Valutino but Napoleon failed to secure the battle of annihilation he was intending and the Russians continued to retreat following their customary tactic of giving up space for time. By the end of August Napoleon had lost over 100,000 of his central army and the rate of loss was accelerating as the epidemic grew. Though Napoleon had the best military medical staff in the world at that time they were powerless to fight a disease they did not understand. The Russians stood and fought again at Borodino on 7th September. It was a bloody confrontation; the French suffered 30,000 casualties and the Russians lost 50,000 soldiers. However, the Russian army was not destroyed; it retreated again, leaving Moscow open to the French. When Napoleon entered Moscow one week later he had little more than 100,000 tired, sick men left from his central army group. It was a devastated shell of the army that had crossed the Nieman just three months earlier. The French would stay in Moscow for just a month. The Russians deliberately set fires that burned three quarters of the city. Though it offered some shelter, there was no food in Moscow, and typhus raged. The Russians refused Napoleon’s overtures to surrender and on 19th October, 95,000 French soldiers began the long retreat back towards the Nieman. By the time the first snows fell on 3rd November, the army was already in a desperate state and as the temperature fell like a stone it merely speeded its disintegration. By the time the remnants of the army re-crossed the Nieman in the middle of December there were just 25,000 men left of Napoleon’s original central army group of over 400,000. On the 20th December, Napoleon reported to the French Senate, “My army has had some losses but this was due to the premature rigours of the season.” Thus he cemented in everyone’s mind the effect of the winter weather on the campaign. In reality his army was destroyed before the first snow fell. It has been estimated that over 200,000 of them died solely from disease. I bet the relatives of the almost half million casualties of the campaign were so relieved.